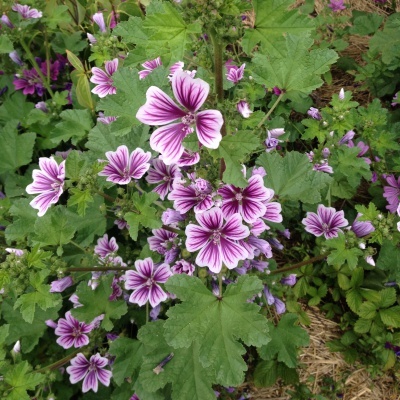 The common mallow is one of the most commonly wild-foraged plants in the Mediterranean region. The leaves make a fine addition to salads, and can be cooked as a potherb. The flowers can also be eaten, and have a mild flavour. The fruits which follow, known as ‘cheeses’ for their resemblance to cheese rounds, are a nice nibble and go well in salads. In more southern climates this plant is a perennial, but in our garden it’s a self-seeding annual. It’s a beautiful plant in the garden or in a salad, and flowers for two months or more in summer.